He stood, one legged, on top of the dog cage we had eyeing me. I could tell he was hungry because the cats wouldn't step into the room. I had tapped cardboard covered with layers of newspaper onto the walls for protection. I filled the kettle with water and set it on the stove. He didn’t move, just stared at me. He stared at me with those golden eyes. It felt as though he could see my soul. I reached to open the window. I don’t know if it was too hurried, or in the general direction, but he stirred. Ruffling his feathers he seemed to dance. Dancing on one leg was quite a trick! He came to live with us because of a string of circumstances. First, a friend found him in the woods. This majestic red-tailed hawk had been injured and was cowered on the ground, filled with infection and dying. 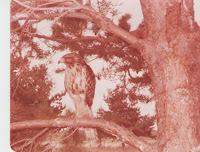 Out of respect for life, this cautious hunter brought an injured bird of prey to my home. With heavy leather gloves to hold, we poured peroxide over the wound, bound it loosely and took him to the local vet. The vet urged us to tend to the bird. The vet said the bird would either heal quickly, or it would naturally lose the leg. After watching the leg atrophy, our red-tailed hawk finally pinched the leg off with one final bite from its massive beak. I filled the cat’s food and water dishes at the counter, taking them outside so they might eat undisturbed by the large bird. Feeling it was more safe for both the cats and their food, I let them eat in peace. Finally, I could see the birds thoughts as though he was writing them in the air. Finally! I opened the freezer. Whoosh! The bird fell upon the package of venison I had in the freezer just for him. 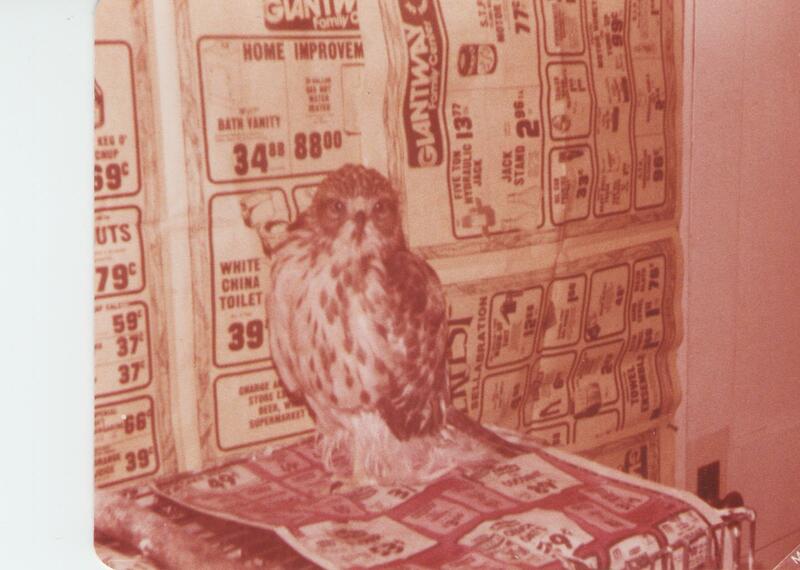 I had a red-tailed hawk in my freezer tearing at the packing paper on the meat. Shooing him out of my freezer, and onto his cage, I unwrapped the venison. Slicing the meat in various sizes, I tried to make him work the food as he would in the wild and yet I had to make the slices manageable for a one legged red-tailed hawk. He lived with me for three years and never once bit me.